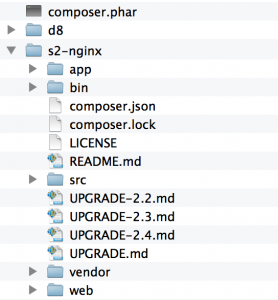 OS-X, NGINX, and Symfony2 – What a Party! Google on OS-X, nginx, and Symfony2 and you’ll pull up a ton of posts. However I find them all confusing or missing pieces. Maybe I’m getting slow…maybe I’m not the command line guru…but in this post I will give you my take on how to setup these tools on OS-X Mavericks. Why? Well – I’m looking for speed and I suppose a challenge to wrack my brain with. I was serious – basically I’m looking for improvements on the ‘ol LAMP/OAMP stack. I have a program that is going to require some advanced processing power so I’m looking at how to scale better with PHP and web services. Apache has never been a great performer at scale. Most hosting companies have switched to nginx at the web tier for this reason. Since my personal machine is a MBP, I’ll be working with OS-X. I suppose for a server OS I would probably pick CentOS or something like that. I have VirtualBox installed so I could save myself some time and simply use that, but that’s no fun. A note of caution: I am setting this up on my dev laptop, not a production server. Security is critical and I have not “battle tested” this configuration. That’s a lot of places to poke around, right? Right. The first place to start is with OS-X. You’ll need to have XCode installed with the command line tools…probably means you need to be an active Apple developer. I’m going to rely on homebrew as a package manager so you’ll need that. To use homebrew you’ll need curl…here’s a good guide for how to get this setup. That will download and install everything you’ll need. Brew is pretty cool. What it did was download and install all the things you need in /usr/local/Cellar/ and then created the symlinks you need in /usr/lcoal/bin so that now your PHP environment is all ready to go. PHP should be installed in /usr/local/Cellar/php55. The .ini configuration files will be in /usr/local/etc/php/5.5 you can get to them via command line or with Finder using the “go to” option in Finder. There are a variety of ways to get MySQL installed – including using brew, but I choose the easy solution of using the downloadable binary from the MySQL community. I also like the MySQLWorkBench for doing all my admin work. Its a decent GUI for OS-X actually – only beef I have is that it does not check for updates automatically. I’m not going to run through how to configure all security stuff – just know that you should do it. I set the error logging directory to a folder in my home directory to make it easy to get to the logs. In the http section I did the same for the access logs. In the http section I changed the port to 80 and set the root directory to /Library/WebServer/Documents. I added index.php as an allowed type. Throw a php file with the ‘ol info call in it and make sure it loads up. You can see that I did something different. 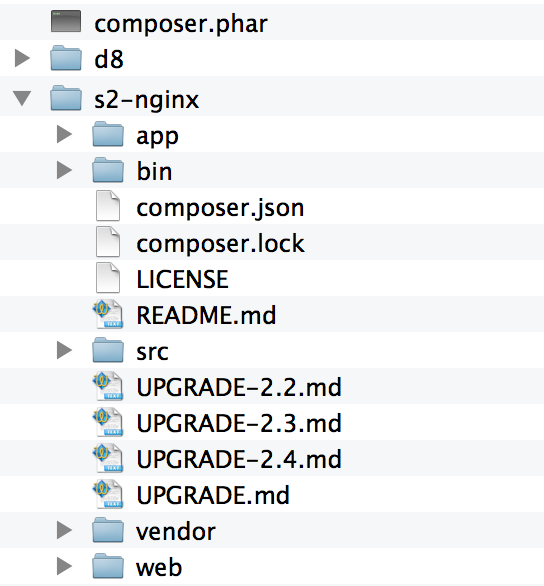 I have a single “master” composer file in the directory above so that all my S2 project share the same revs. Also keep in mind that I am setting this to use /Library/WebServer/Documents as the www root. On OS-X this means I have to sudo all the changes. This can be a PITA, but it is also secure so just get used to being king of “sudo” or hack your box by messing with groups or whatever. Once you have the basics working you can create a virtual server in nginx to make things work nice using a local entry in your hosts file. Go ahead and add s2.local as a 127.0.0.1 entry in your hosts file (on OS-X this is in /etc). Restart FPM and nginx. Voila! In the above I’m assuming that this is for a dev server. If you want this for production you need to modify the index from app_dev.php to just app_php and the location line in the same way. 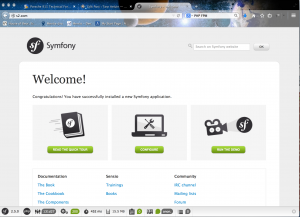 With all this done you should be ready to go with Symfony2 development on PHP. 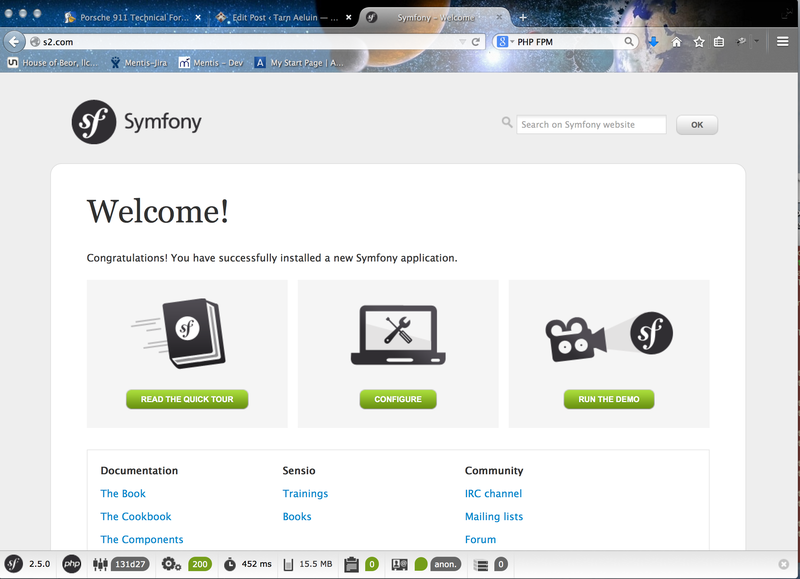 You can keep on creating new apps and virtual servers like I did above add/remove them by removing the symlink. Pretty neat I think. I think it does take some getting used to with this setup, but once you get the hang of it, it is pretty nice. Hopefully you found this helpful. I’ll keep coming back and adding more details over time along with any improvements I come up with. I’m working on getting Xdebug working with this using PHPStorm.